The CMA CGM Benjamin Franklin ship arriving at the Port of L.A. on Saturday, Dec. 26, 2015. The largest container ship to ever dock in North America arrived at the Port of Los Angeles Saturday morning. 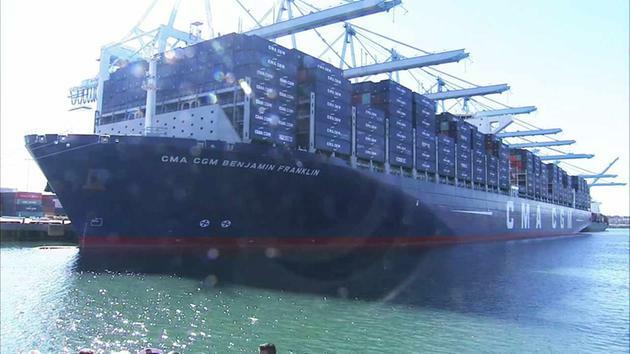 The CMA CGM Benjamin Franklin is 1,306 feet, which is longer than the Empire State Building, and rises out of water nearly the size of a football field. Its width matches than of an Olympic-sized swimming pool, port officials said. The French vessel can transport 18,000 containers, which is a third more cargo than most ships at the port. It's even too big to pass through the Panama Canal. L.A. Mayor Eric Garcetti spoke at the arrival. "This ship is called the Benjamin Franklin because it embodies the relationship that has existed between our nation and France...," said Garcetti. "Here we have this great French ambassador visiting America and repaying the favor." The ship was expected to be unloaded at the port over the next four days. It was scheduled to return to Southern California, docking at the Port of Long Beach sometime in early 2016. Los Angeles and Orange Counties are home to 11 of the 12 most-congested freeway segments in California, according to Caltrans, including this stretch of Interstate 405 in Los Angeles. Lawmakers are debating how to find money to fix the state’s deteriorating roads and bridges. 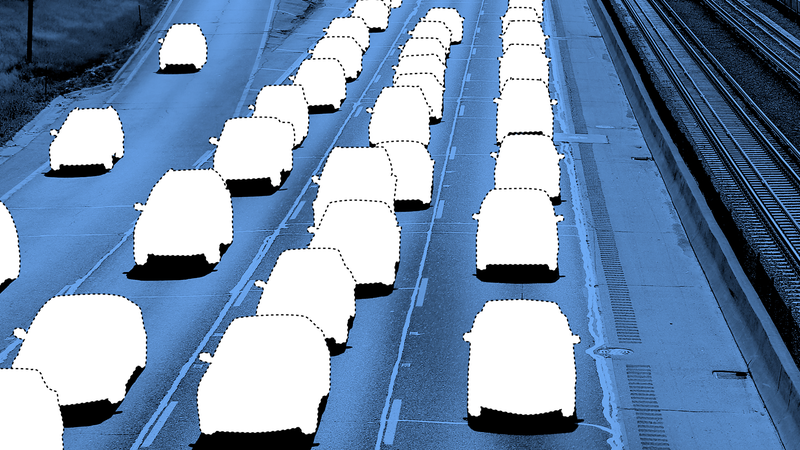 But it will be almost impossible to end Californians’ top driving headache – congestion. Making roads wider is a traditional solution. But this holds little appeal in California, where land is expensive and urban corridors are densely packed. Also, for environmental reasons, officials want people to drive less. So future solutions will rely heavily on measures to manage traffic demand and on incentives to encourage Californians to get off the roads and onto public transit or bikes. The emerging revolution in automobile technology, with automated driving features and carpooling apps, will also help. Relieving congestion is a high priority for motorists and the state. Delays due to traffic cost the state $20.4 billion each year, according to TRIP, a Washington, D.C.-based transportation research nonprofit. Traffic is most acute in the Los Angeles area. There, commuters lose 80 hours each year – more than three days’ worth – to delays, according to the Texas A&M Transportation Institute. It’s the second-worst snarl for commuters in the country (Washington, D.C. ranks first, San Francisco third). Los Angeles and Orange Counties are home to 11 of the 12 most-congested freeway segments in the state, according to the California Department of Transportation (Caltrans). In Los Angeles, local officials recently approved a controversial long-term plan to get people out of their cars. It would repurpose some roadway lanes as part of an effort to add 300 miles of protected bicycle lanes and another 300 miles of transit lanes (some of which could be for the busiest travel times only). One goal is a 20 percent reduction in the average miles driven per capita by 2035. The plan, however, has caused a storm of protest and legal action from opponents who charge that it will make congestion even worse. At the state level, a draft 2040 transportation plan, released this spring, urges improvements in public transit, biking and walking options in order to improve traffic congestion and cut greenhouse gas emissions. Although the overall number of miles driven is projected to increase, models suggest that doubling transit services and speeds could cut the total projected miles driven in California by 6 percent by 2040, according to the plan. With multi-modal development, “we give people other choices than just being stuck on the freeway,” said Joan Sollenberger, statewide manager of transportation planning at Caltrans. Doubling the percentage of trips taken by bicycle could cut the number of projected vehicle miles traveled by 0.41 percent by 2040, the report said. And a 5 percent increase in carpool vehicles could cut projected vehicle miles traveled by 2.9 percent, the 2040 draft said. Caltrans is also trying to relieve traffic by adding more lanes that are restricted to cars with passengers. Often, those restrictions are being added to existing lanes. The report said the effect of this needs further evaluation. Harnessing technology to manage traffic demand is a major focus of the state. The biggest prospective reduction in vehicle mileage could come from making motorists pay more. Modeling suggests that increasing the cost to operate a car by 16 cents a mile in urban areas and 8 cents a mile in rural areas could cut the number of projected miles driven by 17 percent by 2040, the draft report said. Harnessing technology to manage traffic demand – in other words, to change when people drive and how much – is a major focus of the state. Sollenberger of Caltrans can envision a future in which there “may be incentives for people to go buy coffee at the worst hour” of traffic, so they get off the road and delay their trip slightly. Mobile mapping applications, like Google Maps, serve a similar function for some drivers by providing information on real-time traffic conditions. Tim Lomax of the Texas A&M Transportation Institute says such apps may smooth out rush hour, so that a peak period may be, for example, only three hours and a quarter rather than 3.5 hours. Caltrans is investing in technologies, like signs and monitoring, to make trips safer and traffic smoother. On Interstate 80 in the San Francisco Bay Area, one of Northern California’s worst choke points, a pilot project will launch in the spring that includes new electronic signs warning drivers of slowdowns ahead; an alternative, off-freeway route with coordinated signals; and ramp meters on freeway on-ramps to keep traffic flowing smoothly. Caltrans says the $79 million project could cut travel times by 10 percent to 15 percent, depending on the distance. A similar pilot project is planned for 2017 on a stretch of Interstate 210 in Southern California, in the San Gabriel Valley. But the reality is that congestion is a nearly intractable problem, and with the economy picking up, people are driving more again. One wild card is automated driving features in cars, and the coming communication between cars and roadways. Cars of the future should be able to automatically stay in their lanes, for example, and detect red light runners in an intersection ahead. Fewer collisions should mean less congestion. “My prophecy, perhaps, is that there will be a lot of additional benefits,” Sollenberger of Caltrans said. But, she added, they will take years to arrive. A federal policy that has encouraged Americans to drive to work instead of taking the bus or the train won’t tilt the playing field toward car commuters so much. People who take the bus or train to work should soon be eligible for the same tax benefits as people who drive. A bill that extends provisions of the tax code will permanently set the maximum transit commuter tax benefit at the same level car commuters get for parking expenses. Both classes of commuters can now pay for those costs with up to $255 in pre-tax income per month. The tax deal is expected to clear Congress this week, reports Forbes. Currently, the monthly pre-tax expense for transit riders is capped at $130, while the cap for parking is set at $250. The mismatch primarily works against commuter rail and express bus services, which can easily cost more than $130 per month. In recent years, lawmakers went back and forth between temporarily leveling the playing field and stiffing transit riders. While commuter tax benefit parity is an improvement, eliminating the benefit entirely would be better. A report released last year by TransitCenter and the Frontier Group pointed out that commuter tax benefits amount to a gigantic transfer from low earners to high earners, who are best positioned to take advantage of them. Also, the maximum benefit may now be level for individual commuters, but in the aggregate the vast majority of these tax incentives will continue to go toward driving, an enormous subsidy that makes rush hour traffic congestion worse. Here’s a highway success story, as told by the folks who build highways. Interstate 10, connects downtown Houston to the city’s growing suburbs almost 30 miles to the west). Obviously, when a highway is too congested, you need to add capacity: make it wider! Add more lanes! So the state of Texas pumped more than $2.8 billion into widening the Katy; by the end, it had 23 lanes, good enough for widest freeway in the world. It was a triumph of traffic engineering. In a report entitled Unclogging America’s Arteries, released last month on the eve of congressional action to pump more money into the nearly bankrupt Highway Trust Fund, the AHUA highlighted the Katy widening as one of three major “success stories,” noting that the widening “addressed” the problem and, “as a result, [it was] not included in the rankings” of the nation’s worst traffic chokepoints. There’s just one problem: congestion on the Katy has actually gotten worse since its expansion. Sure, right after the project opened, travel times at rush hour declined, and the AHUA cites a three-year old article in the Houston Chronicle as evidence that the $2.8 billion investment paid off. But it hasn’t been 2012 for a while, so we were curious about what had happened since then. Why didn’t the AHUA find more recent data? Well, because it turns out that more recent data turns their “success story” on its head. We extracted these data from Transtar (Houston’s official traffic tracking data source) for two segments of the Katy Freeway for the years 2011 through 2014. They show that the morning commute has increased by 25 minutes (or 30 percent) and the afternoon commute has increased by 23 minutes (or 55 percent). Growing congestion and ever longer travel times are not something that the American Highway Users Alliance could have missed if they had traveled to Houston, read the local media, or even just “Googled” a typical commute trip. According to stories reported in the Houston media, travel times on the Katy have increased by 10 to 20 minutes minutes in just two years. In a February 2014 story headlined “Houston Commute Times Quickly Increasing,” Click2Houston reported that travel times on the 29-mile commute from suburban Pin Oak to downtown Houston on the Katy Freeway had increased by 13 minutes in the morning rush hour and 19 minutes in the evening rush over just two years. Google Maps says the trip, which takes about half an hour in free-flowing traffic, can take up to an hour and 50 minutes at the peak hour. And at Houston Tomorrow, a local quality-of-life institute, researchers found that between 2011 and 2014, driving times from Houston to Pin Oak on the Katy increased by 23 minutes. Maybe commuters will be forced to make different decisions. But for the boosters at the AHUA, their prescription is still exactly the same: build more roads. Claiming that the Katy Freeway widening has resolved one of the nation’s major traffic bottlenecks is more than just serious chutzpah, it shows that the nation’s highway lobby either doesn’t know, or simply doesn’t care what “success” looks like when it comes to cities and transportation. MUSING WITH MIRISCH --The Jewish Journal's quote of the week of Nov. 26, in reference to Beverly Hills's conflict with Metro, was former county supervisor (and Metro macher) Zev Yaroslavsky's zinger: "Fighting Metro is not a construction project, it's a destruction project." There is so much arrogance and ignorance rolled up into Yaroslavsky's statement, it could easily give rise to a new portmanteau word to describe the chutzpah: arrogrance. It is hard to know where to begin, though correcting a major deficiency in the article from which the quip was lifted would probably be a good start. Beverly Hills is not trying to stop the subway. Beverly Hills has never tried to stop the subway. The sole issue for the City of Beverly Hills, along with the school district, has been the routing, which was originally planned to run down Santa Monica Boulevard, but which mysteriously was re-routed to Constellation under the city's only high school when a well-heeled developer and a major political donor snapped its fingers and the Metro Board, led by Yaroslavsky, asked "how high?" Yaroslavsky once famously described the county board of supervisors as "Five Kings" but the lack of factuality, transparency and logic behind his statement regarding the entire Purple Line extension seems more befitting of the Politburo. Trying to make sense of his statement is neither a construction project nor a destruction project, but rather a deconstruction project. The JJ's article rehashes Metro's argument that a fault along Santa Monica Boulevard makes it unsafe to build a subway station at the original site on Santa Monica and Avenue of the Stars. Seismologist-to-the-stars, Lucy Jones, is quoted suggesting that evidence of a fault on Santa Monica Boulevard is "compelling." One must ask if this citation is pre- or post- the trenching which the school district performed. Of course, trenching is considered to be the gold standard of seismological evidence and the trenching the school district performed along putative fault sites turned up absolute bupkes. Dr. Jones is also serving as LA's "earthquake czar," and if, despite the new evidence provided by the trenching, she truly believes a dangerous fault impedes the ability to build along Santa Monica Boulevard, one needs to wonder why she hasn't sounded the alarm about the 40 story condo tower at 10000 Santa Monica Boulevard currently under construction right next to the high school, or the major Westfield Mall addition on the other side of Avenue of the Stars, also directly on Santa Monica Boulevard. What the article also leaves out is that last year the school district, the City of Beverly Hills, the FTA, the Department of Justice, and key Metro staff members entered mediation in an attempt to achieve a global resolution of the conflict. In fact, after a full day of negotiations, all sides actually agreed on a mediated settlement, which would have addressed the school district's concerns, while allowing Metro to keep the revised route -- despite the fact that it will cost the taxpayers hundreds of millions more than the original Santa Monica alignment, add to travel time, and result in reduced ridership. Importantly, the mediated settlement would have included additional trenching along Santa Monica Boulevard, which would have provided the major public benefit of ending speculation, once and for all, about any potential existence of a fault. Ironically, while the deal was recommended to the Metro Board by Metro staff, it was Yaroslavsky himself who took the lead in killing the mediated settlement, which had been brokered by a retired superior court judge. Being a "king" evidently has its privileges. While it's true that many members of the Beverly Hills community, including myself, have been concerned with some of the financial decisions made by the current school board, the concerns are much broader than funds spent on lawyers in the Metro case. 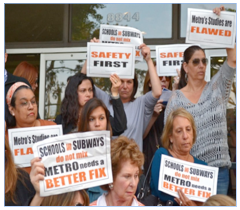 Newly elected board members Mel Spitz and Isabel Hacker, both of whom oppose Metro's route under the high school, rightly pointed out, for example, the former school board's much graver fiscal mistake in linking the district's teacher salaries to Beverly Hills property values. Metro now has a new CEO and new board members, and it is to be hoped that the institutional bullying which is Yaroslavsky's legacy will soon be a thing of the past. 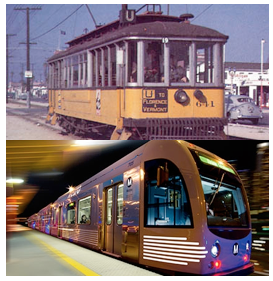 Of course, in addition to the hundreds of millions of wasted taxpayer dollars on the Century City station, that legacy includes the so-called "UCLA/Westwood" station which is not in the "center of the center" of Westwood, but actually closer to the Purple Line's terminus at the VA than to the UCLA campus itself. Sad that UCLA will have a station in name only, but nice, I guess, that the VA will effectively get two subway stations. Of course, it would be even nicer if Metro would actually finally get the VA's permission to place a subway station on its property - something which never happened under Yaroslavsky's reign, but which hopefully can happen now. And wouldn't that just be a mechaya? TRANSPORTATION POLITICS--Compared to the world of the 1990's, and even compared to the year 2000, LA City and County have made considerable progress towards confronting, consensus-building, and construction of transportation projects. No longer is this priority being shunted to the side, and no longer are our elected officials ignoring the problems inherent in transportation and related infrastructure. But there are problems ... big problems. To be sure, the wind is much more on the backs of transportation advocates than it was 10-15 years ago, when marching uphill against the wind was the order of the day for anyone who dared bring up infrastructure. Former President Bill Clinton was probably the greatest champion of this priority over the past several decades, but he had to face a Congress filled with Republican non-spenders and Democratic over-spenders--the former who ignored transportation/infrastructure and the latter who would spend on transportation/infrastructure ("T/I") only after other priorities and their lobbyists were "fed" first...leaving precious few dollars for transportation. Yet the word got out, slowly but surely, that the voters wanted both parties to spend more on transportation/infrastructure and less on other priorities. Certainly the liberals wanted less military spending and more taxes, and certainly the conservatives wanted less social welfare spending and a budget neutral process. But the answers lay somewhere in-between, because more spending but appropriate revenue-raising, and more responsible spending for government in general will both allow for better transportation funding in the federal budget as well as better make the case that a gas tax, or a sales tax, or some other form of revenue raising, will be accepted as a way for voters to see a better 21st Century America with respect to "T/I". Certainly, LA City and County have led the way with respect to transportation funding--they've taxed themselves at the county level multiple times and are embarking on one of the greatest transportation spending works in American history. And to some degree, Los Angeles has both inspired and shamed Washington (and Sacramento, to boot) to get to work in rebuilding transportation/infrastructure strength here and throughout the nation. The Expo Line, once a project that will "neeeeever happen" in the Westside, is entering pre-revenue train testing all the way from Culver City to Santa Monica in mid-December (that's like...now) and transfer of the Expo Line from the Expo Construction Authority to Metro is under way. The San Gabriel Valley is no slouch, either, despite being given short shrift by the rest of the county (particularly Downtown leaders) for far too long, is on its way to a Foothill Gold Line that will open before the aforementioned Expo Line, and will almost certainly someday find the funding to build it all the way to Claremont. And that LAX-Metro Rail connection that has proven elusive for so many decades? It's gonna happen, as sure as Mayor Garcetti and LA County wants a 2024 Olympics. The Crenshaw/LAX and Downtown Light Rail Connector lines will be build well before 2024, as well as the first phase of the Wilshire Subway to La Cienega. Even the long-fretted 405/101 intersection and 405 widening projects are in our rear-view mirror, although the era of big freeway projects are done being built in the center of the county for now. Similarly, the I-710 North project, which includes a tunnel under South Pasadena is being shunted aside for environmental, political, and fiscal reasons. The congestion and pollution benefits weren't there, and the EIR has been roundly attacked by all sides. Certainly the repair and renovation of the I-710 south project between the ports and Downtown has support overall, but the funds for the South Pasadena tunnel will go somewhere...else. But the biggest problems remain both financial and political. Will our recession cycle commence again (hate to say this, folks, but world events and economic reality dictates we're due for another downturn of some sort), and will that affect federal and state funding for transportation? Will we need more money shunted to military endeavors if the world catches fire (as it frighteningly appears to be doing)? ... and threaten support of City residents to pass Measure R-2 if they see their taxes (AGAIN!) go from the roads, sidewalks, rail projects, DASH lines, buses and bicycle paths they've wanted their money to go to for years. The leadership of Eric Garcetti and Mike Bonin for LAX reconstruction and Metro Rail/LAX connections? Great. The leadership of Mike Bonin for a sweeping parking reform package? Great. The ability of Eric Garcetti and Mike Bonin to get past the dunderheads who think that the pension crisis is anything but a crisis? Not so great, although Garcetti and Bonin have to be both pressured and pitied that they've got such an uphill climb on this issue. So we've got a lot to crow about with respect to transportation...but the possibility that the wind will cease to be at our backs with the unhappier potential winds of change to come bodes ill for a mobility/infrastructure effort in a City and County of LA that still hasn't recovered fully from the Great Recession of 2007-09. Lots to see and do this week! We are really excited about ULI’s Transit Oriented Los Angeles conference this Thursday morning – follow @StreetsblogLA for live tweeting from it! Monday 12/7 – Metro is holding a round public workshops on its Active Transportation Strategic Plan. There’s a meeting tonight 4 to 6 p.m. at the Norwalk Community Meeting Center at 13200 Clarkdale Avenue in Norwalk. For additional details see workshop flier [PDF], project summary [PDF]. Pre-registration is recommended via Metro website. Tuesday 12/8 – Metro is holding a round public workshops on its Active Transportation Strategic Plan, with a meeting Tuesday 4 to 6 p.m. at the Torrance Cultural Arts Center at 3330 Civic Center Drive in Torrance. For additional details see workshop flier [PDF], project summary [PDF]. Pre-registration is recommended via Metro website. Tuesday 12/8 – The Culver City Bicycle Coalition hosts its final monthly meeting of the year – from 6 to 8 p.m. at Pieology Pizzeria at 3850 Main St, in Culver City. Details at Facebook event. Wednesday 12/8 – Metro is holding a round of public workshops on its Active Transportation Strategic Plan, with a meeting Wednesday 4 to 6 p.m. at the at Julia McNeill Senior Center, 4100 Baldwin Park Boulevard in Baldwin Park. For additional details see workshop flier [PDF], project summary [PDF]. Pre-registration is recommended via Metro website. Wednesday 12/9 – This week’s Los Angeles City Council Transportation Committee takes place at 1 p.m. at Room 1010 of Los Angeles City Hall. There’s nothing earth-shattering on the agenda, but the committee will discuss the Metro 7th Station tunnel to The Bloc, and some specific oversize vehicle restrictions and preferential parking districts. For more details see agenda [PDF]. Wednesday 12/9 – Latino Urban Forum presents a panel discussion Latina Urbanism Shaping, Enhancing and Preserving the Community with panelists Carmen Argote, Adonia Lugo and Isela Gracian. The free event takes place from 6 to 8:30 p.m. at El Pueblo America Tropical Interpretive Center at 125 Paseo de La Plaza, in downtown Los Angeles. Details at Facebook event. Thursday 12/10 – The Urban Land Institute hosts its Transit Oriented Los Angeles conference from 7 a.m. until 12 noon at the Japanese American National Museum in Little Tokyo. Speakers include Phil Washington and Mark Ridley-Thomas. Registration is $90, with discounts for nonprofits and students. For more details and to register, go to ULI. Thursday 12/10 – Join the East Side Riders and other bike clubs as they host a mini bike show at the Watts Winter Wonderland Festival to illustrate the diversity of bikes, clubs, and riders in the area. The event runs from 4 to 6:30 p.m. on 103rd St., between Compton Avenue and Success Street. Details at Facebook event. Thursday 12/10 – Councilmember Marqueece Harris-Dawson will hold a listening session to discuss ideas with community members about what to do with potential community assets like vacant lots. The meeting will be held at 6 p.m. 239 W. 86th Place in South L.A. Details, here. Thursday 12/10 – The Transit Coalition hosts a dinner to learn about High-Speed Rail, featuring Michelle Boehm, the Southern California Regional Director for the California High-Speed Rail Authority. The dinner takes place from 6 to 8:30 p.m. at the conference room at Metro Headquarters behind Union Station. Tickets are $25, includes dinner, and attendees must purchase in advance via Eventbrite. Friday 12/11 – Westside Urban Forum hosts a breakfast panel on L.A.’s Mobility Plan 2035, featurning FAST, Investing in Place, and Fix the City. The sparks will fly at 7 a.m. at The Olympic Collection at 11301 Olympic Boulevard in West Los Angeles. Tickets are $55, with discounts for students and members – early registration deadline is Wednesday 12/9. More details at Westside Urban Forum. Friday 12/11 – Celebrate the Triforium’s 40th birthday from 4 to 9 p.m. at Temple and Main in downtown L.A. Details at Facebook event. Friday 12/11 – Support Multicultural Communities for Mobility (MCM) at their Turnt Up fundraiser starting at 6:30 p.m. at Self-Help Graphics, at 1300 E. First Street in Boyle Heights. There are easy bike parking and a convenient Gold Line stop. It is only a $25 suggested donation but you’ll want to give even more! Details at Facebook event. Saturday 12/12 – Want to do a 20-mile walking tour of pedestrian overcrossings? Partial versions available, too. Meet at 7:30 a.m. at East L.A. Civic Center. Details at Facebook event. Saturday 12/12 – Take a walking tour of Boyle Heights with James Rojas! The “Lady Of Guadalupe and Jane Jacobs’ tour of the Flats” meets at 10 a.m. at Mariachi Plaza in Boyle Heights. Details at Facebook event. Saturday 12/12 – Southern California Transit Advocates host their free monthly meeting at 1 p.m. at Angelus Plaza (4th floor) at 255 S. Hill Street in downtown Los Angeles. The guest speaker will be Jerard Wright, co-chair of the Sierra Club Angeles Chapter Transportation Committee, outgoing Chair of Metro’s Citizens’ Advisory Council, and a Policy Analyst with Move L.A.
Saturday 12/12 – Various feeder rides converge for Midnight Ridazz All City Toy Ride! Start times and locations at Midnight Ridazz. Sunday 12/13 – take a deep breath, walk, rest, relax, garden, walk again. Next week: Metro keeps on hosting Active Transportation Strategic Plan workshops: Monday 12/14 from 9 to 11 a.m. at Roy A. Anderson Recreation Center, 3980 Bill Robertson Lane in Exposition Park in South L.A. and Tuesday 12/15 from 5 to 7 p.m. at the Santa Clarita Activities Center at 20880 Centre Pointe Parkway in Santa Clarita. For additional details see workshop flier [PDF], project summary [PDF]. Pre-registration is recommended via Metro website. It’s official—America’s new five-year, $305-billion transportation bill, dubbed the FAST act, became law on Friday with President Obama’s signature. The passage of long-term legislation amid the general gridlock of the current Congress is certainly a form of progress in its own right. But far less clear, as experts and advocates wade through the 1,300-page tome, is whether or not U.S. cities made out well in the deal. The good news is there are some bright points for local governments. The brightest involves new flexibility on city street design. In the past, metro area planners had to follow the design standards used by state planners, particularly for projects that involved federal funding. If a city wanted to narrow the lanes of a particular road from 12 to 10 feet, for instance, it often could only do so with the state’s blessing. The FAST bill flips that design script. Moving forward, for federally funded projects where city officials are taking the lead, planners will be able to use a street manual that differs from the state’s official road design publication, provided that manual is approved by the Federal Highway Administration. This theoretically frees cities from the conventions of car-first street standards and lets them design streets more friendly to bikes, pedestrians, and transit users—such as the celebrated Urban Street Design Guide put out by the National Association of City Transportation Officials. “The City of New York could use their design manual and, with this code, be less at the mercy for the state DOT to turn around and say, no you can’t,” says Joe McAndrew, policy director for Transportation for America, an advocacy group that pushed for the change alongside the National Complete Streets Coalition. Changes to the federal TIFIA financing program represent another win for U.S. metros. The TIFIA program offers local governments credits or loans for transportation projects at favorable interest rates. Under the old rules, the project threshold for accessing a TIFIA loan was $50 million—a figure that more or less limited the program to major public works efforts in large metros. The FAST act reduces that threshold to $10 million, bringing projects from smaller cities into play. Projects that involve transit-oriented development are now eligible for TIFIA financing, too. The bad news here is those developments are tempered by a steep loss in overall TIFIA loan availability. FAST cuts the program from $1 billion down to about a quarter of that size, according to some initial estimates. And that also means the program is likely to remain biased toward larger metros that can get applications in more quickly. That might seem like a nice gain when lumped together. But spread out across five years and the hundreds of metropolitan planning organizations in the U.S., and it’s “not going to amount to too much,” says McAndrew. Plus smaller metros—those under 200,000—remain beholden to states for this money. Some states distribute this money in ways that help cities, and some most certainly don’t. Still, taxpayers in these smaller communities won’t get to hold their mayor or council members accountable for transportation decisions, a failure that can result in a general lack of faith in planning operations. On balance, then, the FAST law more or less keeps federal policy toward urban transportation right where past legislation left it. Which is to say it remains centered on the sort of highway spending and road expansion that has historically worsened traffic and sprawl for U.S. metro areas—even as federal funding relies less on the gas tax paid by drivers and more on general taxpayer funding that further weakens the traditional “user pay” system. Cities hoping to see more money go toward public transportation, or other forms of shared mobility, or preparation for autonomous cars may find themselves locked into a familiar frustration. of this split by 1 percent a year, up to 55 percent in 2020, amounting to an extra $3 billion in funding all told. A big infrastructure bill finally passed the House this week, pushing $305 billion over five years to transit and highway projects. In the same week, Uber raised another $2.1 billion, bringing its total valuation to $62.5 billion—roughly the same amount the new bill spends on infrastructure each year. Which of these figures do you think will impact our streets more? The answer will tell you everything about how the way we get around is changing—and how the way we plan for transportation needs to change along with it. Uber is just one example of a company that’s radically altering our streets. Not only is it changing what it means to use a car, it’s now a major player in an autonomous revolution. Uber will transform the landscape of America’s road system, alongside its peers like Google, Apple, Tesla, and others. Yet, if you look closely, nowhere in the new transportation bill is it clear that driverless cars, or even ride-sharing, is guiding the allocation of that hard-won $305 billion. That has to change, fast. 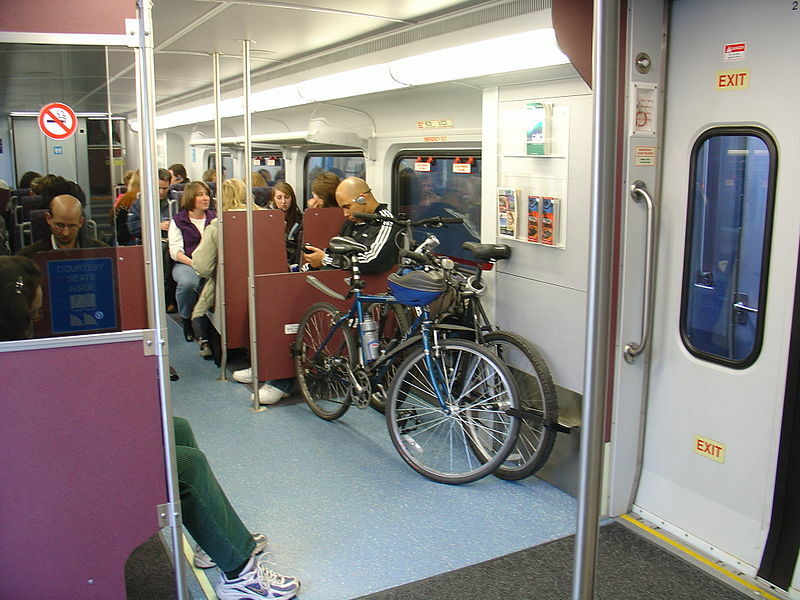 The House bill, nicknamed FAST Act (Fixing America’s Surface Transportation), will help pump much-needed funds into subways, light-rail lines, and other transit projects, including $4 billion per year for biking infrastructure. This is good news. But the FAST Act will also allocate lots of money to expanding or building new highways—an ongoing, outdated attempt by transportation departments to “fix” congestion. This is the big problem with bills like FAST: For any kind of transportation bill to be effective in this country, highway projects need to be uncoupled from transit projects. Why? Because they’re two different things with two very different final outcomes. Widening roads is not a solution for alleviating gridlock, as so many cities have spent billions of dollars over the past few decades learning. Investments in transit on the other hand, including walking and biking infrastructure, have been proven to help traffic flow and save cities money over time—not only due to decreased costs for construction and maintenance, but also from a public health perspective. A truly transformative transportation bill would require that states spend the money on forward-thinking sustainable transit solutions, not backwards car-focused policies. But there’s another, even bigger reason why we need to think about highways separately from transit infrastructure going forward: Within the next five years, how we drive, where we go, and even the number of cars we use to get there is going to change forever. Within the coming decade, America’s roads will likely see its biggest changes since the construction of the Interstate Highway System a half-century ago. Yet we’re still planning for cars like it’s 1956. The US reached “peak car” in 2008. The absolute number of vehicles on US streets has slowly gone down in the last seven years. And whatever you believe about millennials choosing not to drive as part of their personal ethos, or because they can’t afford car payments, one fact is irrefutably true: Right now, the largest generation in the country is driving a lot less than any other generation before it. Then consider the growing improvements to transit, walking, and biking infrastructure, which gets even more cars off the streets. When you toss self-driving vehicles into the mix, you can see just how drastically the urban landscape will change. Because autonomous vehicles will be shared—providing true on-demand rides—there will be fewer cars on the road. That means the space we devote to them also can decrease. Surface parking lots will be a thing of the past. On-street parking will be replaced by a handful of loading and unloading zones. In fact, some experts warn that 85 percent of current road infrastructure should start to be reclaimed by cities now because it will be useless. That’s more room for housing, schools, parks, and economy-generating businesses. Yet, if you look at the money being sprinkled all over the country by this five-year transportation plan, none of this money will likely be devoted to the self-driving future that’s coming. As I reported last month, just a handful of US cities have anything about on-demand services or self-driving cars in their long-term transportation plans—and only Los Angeles has a task force specifically assembled to address how the city should plan for autonomy. If we do this right, we could divert all that money earmarked for unnecessary freeway lanes into projects reclaiming that car-centric real estate. But if we do this wrong, we’re on a collision course with disaster, designing for more and more cars that will never materialize. In addition to uncoupling road and transit infrastructure spending, there absolutely has to be a federal task force that will create a 10-year plan to bring autonomy to US streets, including how to help cities prepare their infrastructure intelligently for this reality. Sweden has a dedicated government department that collaborates with automakers like Volvo, and the US should do the same with self-driving companies here. But it needs to go even further than that. The success of self-driving automakers and tech companies depends on the quality and performance of the country’s roads. Google and Apple and Tesla and Uber are not just users of these roads, they’re the stewards of these roads going forward. Roads are their hardware for solving our mobility problems with better technology. It’s time to start treating these companies as the stakeholders that they are, bringing them into the long-term, high-level planning process. These companies can help build safer, smarter, more affordable streets if our country wises up about how to allocate its transportation money. The FAST Act is heavily earmarked and it’s unlikely that cities can change how its funds will be spent now. But let’s hope we can see some true reform in the next five years. 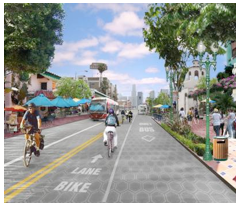 Cities absolutely have to work closely with the companies that are radically altering their streets and start preparing for the ways that people will get around in the future—because that future is nearly here. 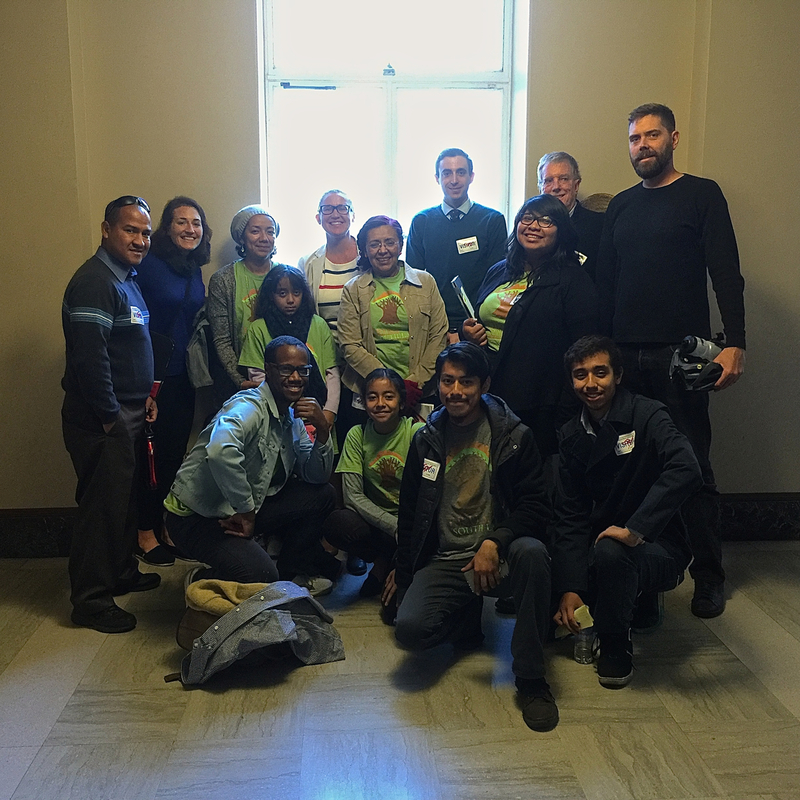 Representatives of the National Resources Defense Council, Investing in Place, Los Angeles County Bike Coalition, Los Angeles Walks, and TRUST South L.A., along with Don Ward/Roadblock, gather outside the City Council chambers. Midway through a rather uneventful City Council meeting — minus the dude pacing the aisle in what looked like a Klu Klux Klan hood made out of a pillowcase — the council took the next steps forward on Mobility Plan 2035. You will recall that Fix the City — tireless crusaders against “lane-stealing” transit users and cyclists — launched a lawsuit against the city for not following proper procedure in adopting the plan to bring Los Angeles into compliance with Complete Streets principles via safe, accessible, and “world class” infrastructure. The council had adopted amendments to the plan and approved it without first sending it back to the City Planning Commission for review. To remedy this problem, the council essentially went the route of a do-over. They would rescind their vote to adopt the amended plan, and then vote to adopt the original draft plan, as considered and recommended by the City Planning Commission and the Mayor last spring. The proposed amendments — now detached from the plan — would be sent to committee for review and discussion. Using this approach, the Plan successfully made it through a joint committee meeting on November 10 and was sent back up for a full council vote. Today’s vote, Councilmember Jose Huizar said as he introduced the rescind/re-adopt motion, would be more procedural than anything (given that the council had previously approved the original Plan in August). And the amendments which were more technical in nature (seeking changes in wording, for example) could be heard in December, while amendments seeking more substantive changes — greater community engagement or voice on implementation, the removal of bike lanes from the plan, etc. — could be heard in February, when there would also be discussion of the environmental impact of potential changes. When Councilmember Mike Bonin stood to second the rescind/re-adopt motion, he said he was doing so to ensure that the Mobility Plan was on the soundest of legal footing going forward. It “doesn’t make a lot of sense in a city that has 300 days of sunshine and is relatively flat,” he said, that 84 per cent of the trips Angelenos make under three miles are made by car. Only two other councilmembers stood to speak. Councilmember Mitch Englander said he agreed with Bonin, but had concerns about the ability of stakeholders to add their input when it came time to implement the plan in their communities. He asked that the council vote twice on the motion — once to approve the rescind/re-adopt resolution and a second time to send any amendments, including two added at the last minute by Councilmember David Ryu, to committee to ensure that they were heard (and, “out of an abundance of caution,” met the legal procedural requirements). As no public comment was heard, Koretz’ brief comments were as adversarial as the discussion on the motion got. When council president Herb Wesson called for votes on the rescind/re-adopt motion and the motion to send all amendments to committee, both passed rather resoundingly. 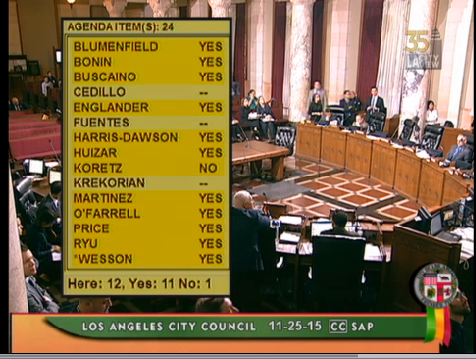 Koretz, Englander, and Ryu opposed the rescind/re-adopt motion (Councilmembers Gil Cedillo and Paul Krekorian were not present; Ryu’s vote first registered as “yes” and then was changed verbally). 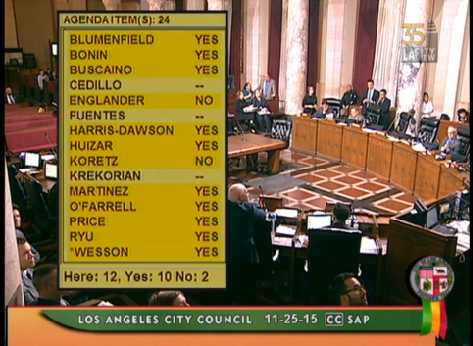 The vote to rescind/re-adopt the Mobility Plan passed with 9 votes in favor, and only Koretz, Englander, and Ryu (verbally) voting in opposition. The vote to send the amendments to the Plan to committee for further review and discussion passed with only one opposing vote. The motion to send the amendments to committee for review and discussion passed with only Koretz voting in opposition. The fact that the Plan had moved forward so easily and so unceremoniously seemed to take community members hoping to speak in its favor a bit by surprise. Only when Wesson moved on to the next item was there finally a smattering of applause. Outside the chambers, the group of supporters gathered to discuss the vote. They were happy, said Malcolm Harris, Director of Programs & Organizing at TRUST South L.A., that the City Council had come out in support of the Mobility Plan. But they were still interested in ensuring that the South L.A. community was engaged on the Plan and that its final iteration was more representative of the vision of a diverse group of stakeholders. Most of the outreach regarding the Plan had taken place online (under the name “LA/2B”) and used language and concepts that were not always accessible or relevant to residents of marginalized communities. Moreover, the level of education in basic planning one might have needed to have in order to either understand the impact of the various options presented in the online surveys or to be able to suggest (and justify) alternatives would have excluded many from being able to participate outright, regardless of their ability to connect to the LA2B website. As a result, the visions of communities like South L.A. were not well-represented in the final product. They were looking forward, Aquino and other members of TRUST said, to further engaging area business owners and residents of all ages, particularly the youth, to dialogue on what a representative plan should encompass. Safer streets for all users can’t come soon enough. Plenty of great happenings as the calendar slips into December. 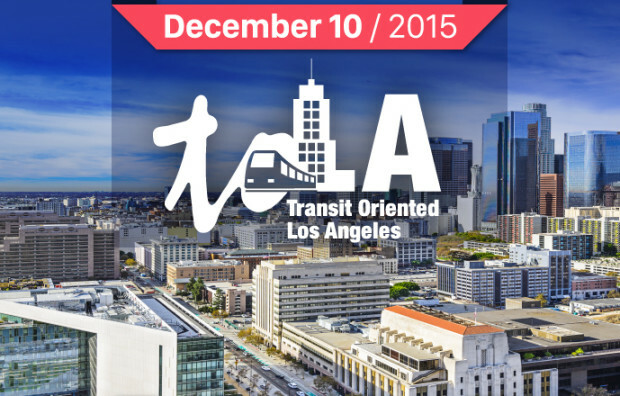 Attend a conference for rail passengers, a Metro board meeting, holiday rides, and more. Plus watch Streetfilms in Santa Monica this Friday! Tuesday 12/1 – The city of Los Angeles Bicycle Advisory Committee meets at 7 p.m. at 6501 Fountain Avenue in Hollywood. To be discussed are planned future segments of the L.A. River and Expo bike paths, Mobility Plan 2035, and more. See agenda [PDF] for details. Tuesday 12/1 – Tomorrow is the last day to vote to name Metro’s Crenshaw/LAX line tunnel boring machine. Details at Metro. Wednesday 12/2 – Santa Monica officials want your input on the latest veteran housing plans for the 387-acre West L.A. Veterans Administration campus overhaul. Attend a public input meeting from 7 to 8 p.m. at the City Auditorium at 1855 Main St in Santa Monica. View the plan at the project website. More meeting details are at Santa Monica Next. Thursday 12/3 – Metro’s Board of Directors meets at 9 a.m. at the Metro Board Room behind L.A. Union Station. Agenda items include Regional Connection subway construction cost overruns, bike-share fares, and more. Full meeting details at Metro. Thursday 12/3 – Pacoima Beautiful and Mayor Eric Garcetti’s Great Streets Initiative invite you to a Pacoima Street Values Open House taking place along Van Nuys Boulevard from 6 to 8 p.m. at Pacoima Neighborhood City Hall at 13520 Van Nuys Blvd. Refreshments, child care, and translation will be provided. Additional details on flier [PDF] or call Max Podemski at (818) 899-2454. Friday 12/4 – SBLA sister site Santa Monica Next hosts a night of Streetfilms starting at 7 p.m. at Vidiots at 302 Pico Boulevard in Santa Monica. Details at Facebook event. Friday 12/4 – The documentary film Bikes vs. Cars opens at the Laemmle Theaters in North Hollywood. Saturday 12/5 – The LACBC’s Culver City Bicycle Coalition hosts a free holiday ride. Gather at 9:30 a.m. at Veteran’s Park at 4117 Overland Avenue in Culver City. Leisurely six-mile ride rolls out at 10 a.m. If you can, bring an unwrapped toy to donate. Details at Facebook event. Registration costs $35. Sign up in advance via Eventbrite. Saturday 12/5 – Decorate your bike in advance of Sunday’s NELA Holiday Parade. A decorating party takes place from 1 to 4 p.m. at 5608 Monte Vista Street in Highland Park. Bring decorating supplies and creativity! Details at Facebook event. Sunday 12/6 – Figueroa for All encourages all to ride bikes in the NELA Holiday Parade. Gather at 10 a.m. at 5608 Monte Vista Street in Highland Park. Details at Facebook event. Decorate your bikes during Saturday’s bike decorating party; see above Saturday event. Gabe Klein is one of the United States’ top livability leaders. From the private sector, he became a maverick city transportation department head for Washington D.C., then Chicago. In leading those DOTs, he championed innovative multi-modal approaches that activate streets. He embraces bicycling, walking, and new technologies. This year, he has a new book out titled Start Up City: Inspiring Public & Private Entrepeneurship, Getting Projects Done, and Having Fun. Streetsblog L.A. caught up with Gabe Klein just over a week ago, after his inspirational closing keynote talk at the California Transit Association’s annual conference in Pasadena. 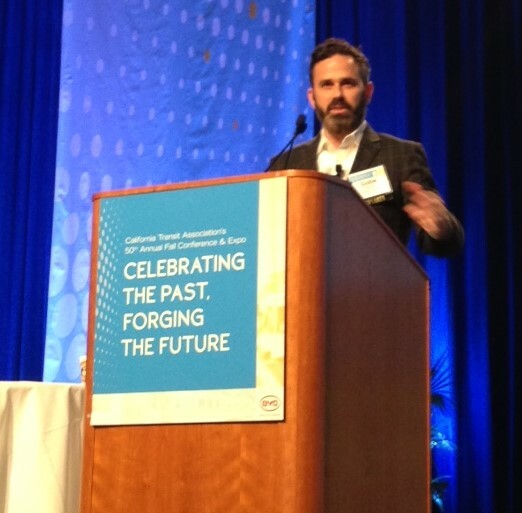 Gabe Klein speaking at the California Transit Association conference. Photo by Joe Linton/Streetsblog L.A.
SBLA: Let’s start with car-share. You led Zipcar expansion in Washington D.C. What’s your advice for L.A. regarding car-share? Klein: Whether it’s taxis, that are limited here, car-sharing – it’s going to be challenging as long as everybody needs to own a car. When you look at where companies like Zipcar do well, they do well in places that are pretty transit-oriented or car-lite. In D.C., 38 percent of people own a car – a little more than a third. So car-share not only encourages more people to give up cars, but it serves the existing population. I think in L.A., you need more of this type of development [gestures to pedestrian paseo], more urban village type development. We can actually place Zipcars on premise. Being realistic, I think I would focus on people getting rid of a second car or a third car. In the early days of Zipcar, we saw that: people would go down to one car, and if they knew they had a backstop of Zipcars on premise [then some would give up that car]. The interesting thing about Lyft and Uber is they’re providing that same security blanket that people need to give up a car. So I think you need to embrace all the alternative options, whether there’s a driver or not a driver. Whether it’s Car2Go, Zipcar, bike-share – once people feel comfortable cutting that tether, they may give up their first car as well. Of course, you need great public transportation, and L.A. unfortunately got rid of it all, in the 50s, like many cities. You have buses, but buses are not always as intuitive as rail transit. I think there’s also probably a stigma around here around who rides the bus and who drives. And the car has become a status symbol. There are lots of challenges. Geographically, and I’m not an expert on L.A., but this is a massive place, so I think you have to focus on places that are already dense that are also creative and open-minded to start to implement creative solutions: protected bike lanes, bike-share stations, more car-sharing vehicles, zoning – with maybe parking maximums instead of minimums. Go where it’s easy to do, where you can prove concept – and after that you can take it to other places in L.A.
You need context-sensitive solutions. What we’re seeing in D.C. now – after 20 years of working on these issues – is that the creative solutions, started in the densest parts of D.C. and started in Arlington County where they’ve reinvented themselves, are now spreading to Tysons Corner. Tysons Corner is worse than most parts of L.A. in terms of car culture. They’re reinventing themselves as an urban village with Metro stops. If Tysons Corner can do it, anybody can do it. You’ve got to start somewhere, so you start and you show people what the quality of life can be, then you use that example, that pilot project if you will, to then do it in other places. At that point you have other people saying: I want this here. I want that protected bike lane. I want my kids to be able to walk to school. I want more public safety, more retail activation. L.A. is about to kick-off a thousand bike bike-share system in our downtown. What’s your advice on bike-share? I think you have to have a certain density of service, so if you place a station two miles away from the next station, it’s going to be hard to make it work. We’ve got politicians asking for those outlier stations already. Use that to your advantage. We would tell people “look – we’ll get there. You need to help us fill in in-between then we’ll get there.” So we’ll get more money that way. Because it doesn’t work to have a station out in the middle of nowhere. It just doesn’t function. This is a nodal system; it’s got to be compact. Once you explain that to people and you say no – we’re not going to do that – but if we had more money we could fill in this neighborhood and this neighborhood and then we’ll be there. You have to set some ground rules and understand how these systems work. We have bike-share in the suburbs now, all over Chicago and D.C. We maybe have a gap, then we’ll have a transit stop and we’ll have bike-share extending from that transit stop, so it becomes an extension of your metro system, your bus rapid transit. How should L.A. be planning for autonomous cars? As you mentioned in your talk, should we rip out 85% of our parking? Over time, yes, I certainly hope so. I think you guys are doing a great job: [LADOT General Manager] Seleta Reynolds, [LADOT Transportation Technology Strategy Fellow] Ashley Hand. You have people that actually are thinking more about this than most cities around the country. So I am very hopeful about L.A. because of the quality of the people that you have leading, because they have appointed somebody like Ashley to be a technology fellow that’s really examining this issue. There are so many cities out there that aren’t even aware of it. They literally do not know that it’s coming. They do not know that Teslas currently are autonomous. They do not know that we’re not talking about 2030. We’re seeing these on our streets. You mentioned you have an 18-month-old daughter. How has your daughter changed your perception of transportation in cities? Oh man, it’s profound. I’ve always thought about why do I want to do this work. I’ve done it for other people’s children, for other people’s parents. I’ve done it for my neighbors, and for me. But now that I have a daughter I feel so personally invested in the outcome. I feel almost like I’m on a mission to get the public and private sector to work together to make sure we get the outcomes in cities that we can have, because I want her to be able to live it. Having kids for me has been a revelation. I don’t know why I waited so long to do it. You care so much about them and when they’re young they are so defenseless. I’ve always said we do this work because we want the most vulnerable citizens to be safe; if we design for the most vulnerable citizens, then we will have safe streets for all of us. But, man, when you see a little kid – who doesn’t even understand the difference a sidewalk and a street yet – start wandering towards the street, and you think: one false move and they will be dead. We have four-thousand pound vehicles zipping at high speeds around our cities, where our kids play. You realize it’s got to change. Here’s the question we typically end with. If you had a magic wand that would grant one wish – that would change cities in one way – what would it be? I would like to go back to the 1950s and not get rid of the streetcars. If I could do that, the culture, the world that we live in would be completely different, if we’d reinvested in our streetcar system and ground transit – and not gotten rid of it – and not driven freeways through our cities. Maybe that’s two wishes, but I feel like it’s part of the same problem. So, if we didn’t kill the streetcars and didn’t do the whole urban renewal, then I think we would be a very different society – in lots of ways. For more of Gabe Klein’s perspectives, especially regarding autonomous vehicles, see also this recent L.A. Times interview. Living in Pasadena for the past 15 months now, I do a lot more walking. I’m enjoying walking instead of driving to a restaurant in Old Pasadena. I can ride my bicycle to join friends for a drink at a nearby tavern. Actually, my favorite walking time is Sunday morning — less crowds. When I walk to Vroman’s Bookstore or the movie theaters on Colorado Boulevard it makes me feel more alive when I get there. It’s like I’ve made an effort so it matters less if the movie stinks. A slew of new studies link walking and taking mass transit with improved heart health. People are less likely to develop high blood pressure if they live in a walkable neighborhood, said one study from Ontario, Canada this month. A study from Japan found citizens riding trains or buses to work are less apt to be overweight or develop diabetes. The American Heart Association meeting this month in Florida said the key is walking, city walking or suburban walk-your-dog walking, it is all good. Well, not all is good. There is one problem. You can get run over. Not a day goes by when as a pedestrian, I nearly become a statistic. That is not an exaggeration. In 2013, 4,735 people were killed walking in the U.S. and that usually involved their unfortunate meet-up with a vehicle made of steel. The National Highway Traffic Safety Administration also says there are 66,000 reported pedestrian injuries every year, or one injured every eight minutes. That’s far too many. On a lunch break, I was crossing Lake Avenue at Green Street on a green light. The hand flashed go and the countdown began when a car turning left crossed a few yards in front of me. I was just a few feet behind a taller man with gray-blonde hair, about my age, who cursed out the driver and tossed him the bird. “I know how you feel but unfortunately, it happens every day,” I said as we safely reached the curb. He mistook my accounting for reluctance, or worse, benign acceptance. Not wanting to leave that impression, I am writing this column. But also because my wife thinks I’m overreacting every time I remind her that being in a crosswalk doesn’t make you any safer. How about a green light that flashes a message “watch for pedestrians”? Or lighting up the intersection crosswalk when a pedestrian is present? For the driver turning left, a dedicated arrow is one solution. But it’s not practical to put green arrows that protect pedestrians at every intersection in Los Angeles County. That’s why the Los Angeles Department of Transportation is figuring out where to place more dedicated green arrows, Bruins said. Eventually, everyone will get the message. Already, with more bicyclers on the streets of the county, “we haven’t seen a huge number of people getting hurt,” Bruins said. But until more concrete solutions are rolled out, there may be strength in numbers. “The one thing we’ve learned is that the more people do walk and bike, the safer it gets,” Bruins said.